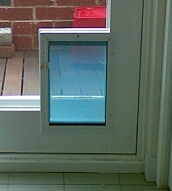 At Top Cat Pet Doors, we have a range of dog doors to suit any size. We can even custom make a door to suit french colonial style doors that are to narrow for a standard pet door. Safety Glass, and new toughened safety glass. Can be installed in Timber doors, brick walls, and new toughened safety glass. Timber doors, and new toughened safety glass, Security Screens. Timber, new toughened safety glass and French doors.